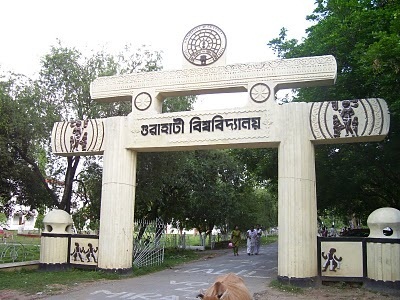 The entrance gate of Gauhati University. The Gauhati University has been granted ‘A’ grade by the National Assessment and Accreditation Council (NAAC). It has scored 3.04 (CGPA) on a four-point scale. The university was last accredited ‘B’ grade by the NAAC in 2010, when it had scored a CGPA of 2.92. A team of NAAC members had carried out a thorough assessment of the university from May 22-24 this year. The inspecting NAAC members had evaluated the university’s research activities, infrastructure facilities, quality of students and faculties, amenities and academic and co-curricular activities. A new methodology was adopted this time, with 70 per cent based on data provided by the varsity and 30 per cent based on visit by the NAAC team. The accreditation to the varsity was recommended by the NAAC during its 66th standing committee meeting held today at Bengaluru. The validity of this accreditation status will remain for a period of five years with effect from Friday.